From: "Les Tablettes Guerrieres, Ou cartes choices, Pour la commodite Des Officiers er Des Voyageurs" . 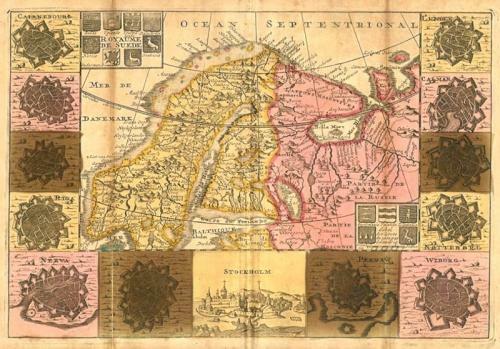 A double page map in period hand colored that shows Scandinavia with parts of Russia, and Lithuania, inset vignettes of Stockholm, Riga, Nerva, Pernaw, Wiborg, Calmar and Lunden. The condition is good with some discolouration and verso reinforcement to the folds.